This article is about the parable of Jesus. For the Buddhist parable, see Kisa Gotami. The Parable of the Mustard Seed is one of the shorter parables of Jesus. It appears in Matthew (13:31–32), Mark (4:30–32), and Luke (13:18–19. In the Gospels of Matthew and Luke, it is immediately followed by the Parable of the Leaven, which shares this parable's theme of the Kingdom of Heaven growing from small beginnings. It also appears in the non-canonical Gospel of Thomas (verse 20). He set another man before them, saying, "The Kingdom of Heaven is like a grain of mustard seed, which a man took, and sowed in his field; which indeed is smaller than all seeds. But when it is grown, it is greater than the herbs, and becomes a tree, so that the birds of the air come and lodge in its branches." The plant referred to here is generally considered to be black mustard, a large annual plant up to 9 feet (2.7 m) tall, but growing from a proverbially small seed (this smallness is also used to refer to faith in Matthew 17:20 and Luke 17:6). According to rabbinical sources, Jews did not grow the plant in gardens, and this is consistent with Matthew's description of it growing in a field. Luke tells the parable with the plant in a garden instead; this is presumably recasting the story for an audience outside the Levant. I. Howard Marshall writes that the parable "suggests the growth of the kingdom of God from tiny beginnings to worldwide size." The Parable of the Leaven (which in the Gospels of Matthew and Luke immediately follows) shares this theme of large growth from small beginnings. As with the Parable of the Sower, which in Matthew and Mark occurs earlier in the same chapter, the man sowing the seed represents Jesus, and the plant is the Kingdom of God. The nesting birds may refer to Old Testament texts which emphasize the universal reach of God's empire, such as Daniel 4:12. However, a real mustard plant is unlikely to attract nesting birds, so that "Jesus seems deliberately to emphasize the notion of astonishing extravagance in his analogy." Other commentators have suggested that the birds represent Gentiles seeking refuge with Israel or the "sinners" and tax collectors with whom Jesus was criticised for associating. A few commentators view the birds negatively, as representing false teachers invading the church. Some have identified a "subversive and scandalous" element to this parable, in that the fast-growing nature of the mustard plant makes it a "malignant weed" with "dangerous takeover properties". 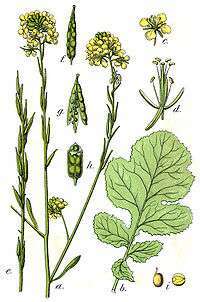 Pliny the Elder, in his Natural History (published around AD 78) writes that "mustard… is extremely beneficial for the health. It grows entirely wild, though it is improved by being transplanted: but on the other hand when it has once been sown it is scarcely possible to get the place free of it, as the seed when it falls germinates at once." Ben Witherington notes that Jesus could have chosen a genuine tree for the parable, and that the mustard plant demonstrates that "Though the dominion appeared small like a seed during Jesus' ministry, it would inexorably grow into something large and firmly rooted, which some would find shelter in and others would find obnoxious and try to root out." 1 2 3 4 5 I. Howard Marshall, The Gospel of Luke: A commentary on the Greek text, Eerdmans, 1978, ISBN 0-8028-3512-0, pp. 561. 1 2 John Nolland, The Gospel of Matthew: A commentary on the Greek text, Eerdmans, 2005, ISBN 0-8028-2389-0, p. 551. 1 2 Joel B. Green, The Gospel of Luke, Eerdmans, 1997, ISBN 0-8028-2315-7, p. 526. ↑ Richard N. Longenecker, The Challenge of Jesus' Parables, Eerdmans, 2000, ISBN 0-8028-4638-6, p. 141. 1 2 3 4 Michael F. Bird, Jesus and the Origins of the Gentile Mission, Continuum, 2006, ISBN 0-567-04473-4, pp. 73–77. 1 2 Ben Witherington, The Gospel of Mark: A socio-rhetorical commentary, Eerdmans, 2001, ISBN 0-8028-4503-7, pp. 171–172. ↑ Herbert Lockyer, All the Parables of the Bible, Zondervan, 1988, ISBN 0-310-28111-3, p. 188. ↑ Pliny the Elder, Natural History, translated by Harris Rackham, Loeb, 1950, Book XIX, Chapter LIV. Wikimedia Commons has media related to Parable of the Mustard Seed.